Chicken thighs, marinated in a tangy blend of yogurt, lemon, garlic & spices, and grilled on skewers until golden brown. This is one of my favorite recipes for entertaining. Chicken thighs are marinated in a tangy Middle Eastern-style blend of Greek yogurt, lemon, garlic and spices, then grilled on skewers until golden brown. The kebabs are delicious over a bed of golden Basmati Rice Pilaf with Dried Fruits and Almonds (as pictured above) and with my Roasted Carrots with Thyme or on top of a Greek salad. Just be sure to make extra — the first time I made this dish for a crowd, I actually ran out of food! Begin by combining the marinade ingredients in a small bowl. You’ll see that there’s a good bit of crushed red chili flakes in the recipe. I love the heat, but you can always cut back a little if you prefer. Next, prepare the chicken. I’ve specified boneless skinless chicken thighs for this recipe. They’re more flavorful than chicken breasts, and easier to cook without drying out. I know some people prefer white meat (my husband included) but I’d urge you to try the chicken thighs — I’ve made it both ways, and it’s far superior with dark meat. The only drawback to using chicken thighs is that they need to be trimmed of any excess fat and gristle before you use them. I think it’s easiest to use kitchen shears, as opposed to a knife. (Note that there’s a fair amount of waste with the thighs — that’s why the recipe calls for 2-1/2 pounds of dark meat versus 2 pounds of white meat.) Using the scissors, cut the meat into bite-sized pieces and then thread onto skewers alternating occasionally with the red onions. Place the kebabs on a baking sheet lined with foil, and then spoon or brush the marinade over top, making sure to coat well. Cover and let the kebabs sit in the fridge for at least 8 hours or overnight — the longer the better. Preheat the grill to medium-high heat, grease well, and then grill the kebabs until golden brown. As you can see, the yogurt makes a thick marinade that adheres to the chicken and creates a flavorful crust as it cooks. This is a good one…Enjoy! In a medium bowl, combine the yogurt, olive oil, paprika, cumin, cinnamon, red pepper flakes, lemon zest, lemon juice, salt, pepper and garlic. Thread the chicken onto metal skewers, folding if the pieces are long and thin, alternating occasionally with the red onions. Be sure not to cram the skewers. (Note: You'll need between 6-8 skewers.) Place the kebabs on a baking sheet lined with aluminum foil. Spoon or brush the marinade all over the meat, coating well. Cover and refrigerate at least eight hours or overnight. Preheat the grill to medium-high heat. To grease the grill, lightly dip a wad of paper towels in vegetable oil and, using tongs, carefully rub over the grates several times until glossy and coated. Grill the chicken kebabs until golden brown and cooked through, turning skewers occasionally, 10 to 15 minutes. Transfer the skewers to a platter and serve. Note: I've specified chicken thighs as opposed to boneless chicken breasts for this recipe because they are more flavorful, and less likely dry out. Additionally, the lemon juice in the marinade will make boneless chicken breasts tougher when cooked. So great! Loved the red pepper flakes as they added heat. Made with the suggested rice pilaf for a wonderful dinner! Will make again. If I use boneless skinless chicken breasts, I know that I should avoid the lemon juice. Should I increase the amount of lemon zest, and if so, by how much? Hi Aaron, Yes, I’d increase it by 1.5, so use the zest of 1-1/2 lemons. Hope that helps! I was hesitant to use thigh meat as I’m not a fan of dark meat, but it was delicious!! Will definitely make again and next time make a bigger batch!! Another winner! 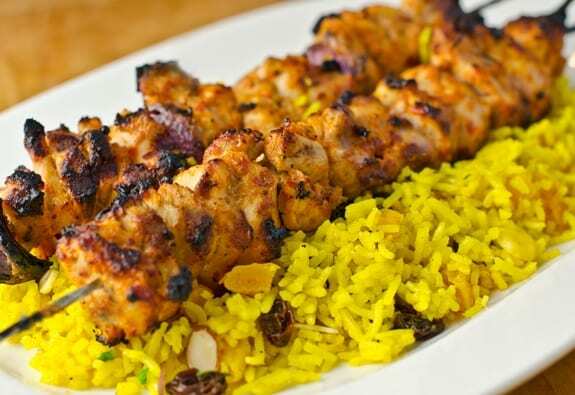 We love the Middle Eastern Chicken Kebabs. We served them with the Roasted Carrots with Thyme. I followed the recipe as written, except I used 0% Greek yogurt. It makes a nice marinade that sticks to the chicken. The spices were interesting, and we used the red pepper flakes since we like spicy. I liked the roasted carrots, especially the caramelization and the thyme. Will definitely make the carrots often. It’s a nice change for a side dish. OMG! I have made these several times and my husband and I devour them. The only change I make is with the yogurt I can’t always find the plain yogurt, so I have used vanilla but you can’t even taste the difference. Really simple and great tasting recipe. Didn’t have time to let it marinate for more than a couple of hours but the flavours were plentiful and very authentic. Add this to my favourite kebabs list! Made this for a dinner party last night and it was a huge hit! It was very easy to make and the chicken turned out very moist and flavorful. I love the fact that it marinated overnight so that all I had to do when it was time to cook was pull it out of the refrigerator and put in on the grill. This is definitely a keeper! This was such a hit!! For people wondering about a dairy free substitute for the yogurt, I used half a can of full fat coconut milk. I’m sure it changed the overall taste of the dish, but with an allergy I’ll never know the difference. Since the coconut milk is thinner than a Greek yogurt I marinated the cut up thighs in a bowl to make sure they were saturated, then skewered the next day before grilling. Really great flavor that my family all loved. I served this with the rice pilaf, which was also amazing. Sure, Sue, I’d use your broiler — cook it for about the same time as indicated in the recipe – and you’ll need to turn it occasionally just as you would on a grill so that it browns evenly. Hope you enjoy! I would say this is more of a tandoori chicken than middle eastern chicken. It was good, just not what I was looking for in a recipe. I agree. It was really good / flavorful, but I was looking for more of a Persian chicken recipe and this was more tandoori. Hi, I’ve made this many times and served to many people and everyone loves it. But I have a question…..I’m out of skewers……and I want to make this tomorrow and have no time to pick some up. Do you think I can just put them in a broiling pan and broil it? Or do I need to somehow get myself to a store and pick some skewers up? Thanks so much! Sure, Marie – it’s perfectly fine to broil the chicken w/o skewers. i followed everything in your recipe and i loved it. I cooked it for my (picky) friends and they loved it too. One of the best and easiest dish to cook. If i’m too lazy to cook, baking it tastes as good. Thank you very very much. Hi! When the recipe says 2-1/2, does that mean 2-2,5? I am an inexperienced broiler. It’s going to be about 15° when I need to do these so it’s a must that I do them in my oven. I have searched through most of the reviews but can’t find the answer to my questions. I even looked for a tutorial on YouTube. How close to the broiler should the chicken be and should it be resting in the broiler pan or suspended a little? Is it possible to do them right on the baking sheet that they are marinating on? Sorry for the technical questions. First go at these kebabs! Looking forward to this. Total fan of your website and have used many of your recipes time and time again. Also have your cookbook. Wonderful!! Thanks so much. Hi Rebecca, So glad you enjoy the recipes! I’d use the broiler using a broiling pan. (They can rest right on the broiling pan, but the drippings will go into the pan underneath.) Put your broiler on high approximately 3 inches from the heating elements and cook it for about the same time as indicated in the recipe – and you’ll need to turn it occasionally just as you would on a grill so that it browns evenly. Hope that helps and that you enjoy! In my top 5 all time favorites. I follow your recipe to the letter. I agree that boneless thighs are a must and even a novice cook will have a difficult time overcooking. I made it last night and my wife raves every time, which is now probably around 70 times. Thank you Jenn. Super awesome recipe! I normally don’t follow the recipe as written but this one is an exception. I am so proud of myself after I tasted the chicken and rice!! Will definitely cook this recipe over and over. I marinated the chicken for 48 hours. I love your recipes. I’ve pre made the chicken marinade but realized that I used fat free Greek yogurt by mistake. Is there a way to add some fat to the marinade? Hi Lila, I wouldn’t worry about it but you can add an additional tablespoon olive oil. Made these broiled in the oven and they were delicious! Have you tried this recipe with pork? Which cut might work best – tenderloin? Thanks! Hi Oleysa, glad you enjoyed these! I actually wouldn’t recommend pork here – tenderloin would be tough and the cooking time would be different with any other cuts – sorry! Family loved this and has made it to our must make again list. Would love to make a more “Greek” version. How would you adjust the marinade? Perhaps skip the cumin, cinnamon, paprika and add oregano? Every recipe I’ve made is 5 star! Sure, John – that should work well. You could also add a little dried thyme. I’d love to know how it turns out! This is my favorite chicken kebabs recipe. I made them many times and they always came out great! I usually make them in the oven, without using the lemon juice, (I use the zest only and slightly reduce the amount of salt and garlic also. Delicious with a Greek Salad and/or the Basmati Rice Pilaf with Dried Fruits. Can the skewers be made on the oven? Sure, Taz. I’d use your broiler — cook it for about the same time as indicated in the recipe – and you’ll need to turn it occasionally just as you would on a grill so that it browns evenly. Hope you enjoy! Amazing! Had to be patient and up the heat on the grill to crisp them off, not usually a fan of chicken thighs but they tasted awesome! I served them over fries and salad with garlic mayo. Will be doing these once a week now! Can I make this in a slow cooker or instant pot? Hi Niki, I’m not familiar enough with a slow cooker or instant pot to have a good sense as to how this recipe would work in one of them. Here are some tips on adapting recipes for slow cookers or instant pots. Absolutely stellar recipe! I made it as written and it was perfect. The spices and flavors were so perfectly balanced it was amazing. I paired it with the basmati rice pilaf , naan bread, tzatiki, and hummus. Wish I could claim the recipe was mine. So delicious! Served it with the Basmati Rice Pilaf, some tzatziki and a rocket, red onion and lemon salad. Will definitely make again! I got a lot of compliments with this recipe. It is perfectly delicious. Made this recipe as is for a guest who is a gourmet chef who loved it as did we. She asked for both this recipe and your sauteed cherry tomato recipe. a nice combination. Love all of the recipes I’ve made–all have been a hit with guests a44nd my husband. Hi – I’ve used your recipes and really enjoy them. But, I’m kosher. Can you suggest a substitute for yogurt in this dish? Glad you like the recipes, Dan. 🙂 If you can find a non-dairy yogurt in your grocery store, I think that should probably work here. Hope you enjoy! At what temp should I bake this and for how long? Hi Shah, If you’d like to prepare these in your oven, I’d use your broiler — cook it for about the same time as indicated in the recipe – and you’ll need to turn it occasionally just as you would on a grill so that it browns evenly. Hope you enjoy! Can I make this a day ahead and serve the next day- how should I reheat? I wanted to make this as my chicken dish for Rosh Hashanah along with a brisket. Hi Susan, I’d reheat them in the oven in a baking dish covered with foil. Hope everyone enjoys! Can I do this with shrimp? Would I let it marinade as long as the chicken (8 hours-overnight) if so? Thanks!! I haven’t tried this with shrimp, but I think it would work. You definitely would cut the marinating time down to 30 – 60 minutes. Also, be careful not to overcook the shrimp – you’ll need about 1 1/2 minutes per side. I’d love to hear how they turn out! great, thanks! I’ll let you know! This has quickly become a family favorite this summer. The flavors are wonderful and the chicken stays so very moist. Another fabulous recipe from Jen…Thank you so much. Oh my, just made this along with the basmati rice pilaf and I’ve never seen my picky three year old eat faster. Two thumbs up Jenn! I’ve made these kabobs a few times now, and they are absolutely amazing. I always broil them. I served them to some friends last night, along with your basmati rice and the Israeli salad from your book– it was SO good; a perfect combo. Thank you! Hi Jenn, I’m planning to serve your Middle Eastern Chicken Kebabs and Warm Couscous Salad w Apricot Vinaigrette at a BBQ this weekend. I’m wondering if a Greek Salad (tomatoes, cucumber, feta, kalamata olives etc.) would be a good accompaniment – or is there a different salad you would recommend? Thanks very much! Hi Jane, the Greek salad you described sounds great! If you wanted to consider something else (though I don’t think you need to), this Roasted Red Pepepr Salad is nice. Thanks Jenn, that does look good! Wanted to thank you for all your hard work, wonderful recipes and quick responses to questions. I love your blog and am enjoying your cookbook very much! Can the marinade be made a day ahead of time? I made this for a group of 50, added a lamb and beef kabob to this recipe, and paired with middle eastern salad, grilled red peppers and tabbouleh. This was such an easy to follow, and tasty recipe, I am saving it for the next time I need a great kabob that really works. I don’t usually write reviews, but this tasted great, and was reliably good for company! Thank you for this great recipe. I was really impressed! Absolutely delicious! Just gets better and better as leftovers, too. I actually don’t find it spicy at all, even with the full amount of red pepper flakes, so I add some hot sauce while eating it – perfect! I made it with the suggested basmati rice accompaniment and it has fed us for days. Thank you for the recipes! This is fast becoming one of our favorite meals. Takes a little time, but we’ll worth the effort. The red onion adds such a special tang with the Mediterranean spices and yogurt. When they grill you get nice crispy edges with so much flavor. I did not change a thing about this and was fantastic each time. I did just leave everything to marinate in a plastic bag over night and skewer them right before grilling, just because I didn’t have room for a platter full of skewers. Wow! This was such an interesting blend of flavors! The chicken was so tender despite the charred edges from the grill. I LOVED the addition of dried fruit to the rice as well! Thank you Jennifer for a very out-of-the-ordinary dinner option – loved it! My kids favorite. I also add some Bell Peppers and Onions. Awesome. Delicious, and portable! I threw it together in a large Ziploc bag on a Fri morning, planning to grill it over the weekend on our boat. We didn’t get to it until Sunday night, and the foodie couple we shared it with declared it a ’10’. We paired it with Basmati Pilaf with Dried Fruit and Almonds and Moroccan Carrot & Chickpea Salad. Delicious…i used breast and it was still delicious! I made this tonight with your basmati rice pilaf and it was a hit! We all thought the kebabs were fantastic and the apricots and almonds were wonderful in the rice. I served it with some grilled zuchinni and peaches to use up the rest of our farm box and made some classic hummus and grilled pita. Such a great summer feast. Thank you for sharing your delicious recipes!!! Absolutely AMAZING! Didn’t change a thing, though I may cut down on the red pepper flake to make it a little more kid-friendly. It was perfect for me as-is. Keep up the good work! Delish!!! Made according to the recipe with chicken breast. Chicken is so tender, I marinated overnight. I also used a 450 oven with kabobs on a rack and turned a few times and finished under the broiler. I made the suggested rice and it was equally great paired with the kabobs! Highly recommend! This is one of our family favorite chicken recipes! Tastes just like the chicken we love from our favorite Mediterranean restaurant! I don’t change a thing and it’s perfect every time ! Last night was the 4th time I made this recipe, and the 1st time I made it on a real grill, which was easier than the grill pan or George Forman. I have always grilled the thighs whole instead of on skewers. The chicken was tender and flavorful; absolutely delicious. This time, I paired it with your rice recipe as shown, and I think I will be officially adding this combo to our summer meal rotation. I was very proud of myself for putting together a meal that isn’t the usual Italian/American dinner, thanks to your clear instructions. You know, Jen, I love the way you pair your recipes. I cook every week for a doctor couple, and the biggest Challenge is what to make for side dishes. Immensly helpful! This is one of my all-time favorite recipes. The chicken comes out moist and flavorful every time. Thank you! Made these and everyone complimented me saying they were great! I only had time to marinate 5 hours can’t wait to make them again and marinate longer! Im prepping food for an outdoor wedding and was wondering if you tried preping and freezing these? Yes, Stephanie, that should be fine. Hope you enjoy! I made these exactly as written. Kabobs were time consuming but so worth it and looks impressive. They were delicious! The yogurt marinade really clung to the chicken even on the grill. Can you use non-fat Greek yogurt? Hi Laurie, It will work, but won’t be quite as rich and flavorful. Are you able to use 2%? This is one of our go-to recipes for dinner. I love the flavors of the marinade, and the rice pilaf is a great side dish. I wish I could make it on the grill, but under the broiler works well, too. This chicken is delish! I paired it with roasted carrots and giada’s Mediterranean couscous salad. My hubby said the best meal he’s had in a long time! I made the chicken as directed except used breast instead of thighs. I left out the lemon juice as suggested and it was PERFECT! Wish I could add a pic! Just made these kebabs the best i have ever tasted. Once tasted you will NEVER cook another recipe. Yum! I really liked the results we got from this recipe. I did change it to chicken breasts because that is what I had on hand but we all know that the thighs are so much more flavorful. I needed a quick lunch and since these were in the fridge waiting for dinner prep, I put a few pieces and some red onion into a hot cast iron skillet and pan seared. Still wonderful even that way. A keeper–that is for sure. These are by far the best chicken kebabs I have ever tasted. The marinade is absolutely fantastic–easy to make and so full of flavor. I made the recipe as is with no substitutions and marinated for 8 hours before grilling half the kebabs. The next night I grilled the other half and they were even better! The extra marinating time was well worth it. I will definitely make them again…and again. These are so, so good. I used the chicken thighs and felt that it was the best choice. It wasn’t all that hard to trim them. Made these for a Sunday dinner and my entire family of 16 love it. Adults and kids! It ok to use only 1.5 lbs of chicken breast? Will the marinade be too overpowering? Hi Victoria, the marinade won’t be overpowering, but you probably don’t need to make as much of it. You could get away with making half the marinade. Hope you enjoy! Instead of kabobs, can I marinate whole chicken thighs or breasts (niece prefers white meat) and broil them? I’ve made the kabobs several times and they are amazing! Just looking for a less time consuming way to make this amazing recipe! These kebabs are so delicious! I made them a few days ago and could not stop thinking about how good they were… so I have another batch marinating right now! I cut back on the red pepper so I could feed this to my one year old, but otherwise followed the recipe exactly. I only had 3 hours to marinate the chicken the first time, so I’m curious to see if this second batch tastes any better after a night in the fridge… I don’t really see how it could though!! This is such an easy dish to make. I broiled the kebabs on high and served them with a Greek salad and pita. My school age kids liked the chicken so much that they ate it cold in their lunches the next day. Thanks for this recipe – it’s my new favorite! The Middle Eastern Chicken Kebabs are absolutely wonderful – the addition of the yogurt & lemon add just enough tang to the recipe. The onion, garlic and spices complete the taste mixture for this dish. I did not deviate from the original recipe. So tasty – slightly spicy warm, and scrumptious right off the grill ! I highly recommend and am anxious to cook it again. My family loves this dish! If it’s too cold to go outside and BBQ, I cook this dish, without skewers, in the oven under “broil.” When you live in the Northeast, you have to improvise when there is a foot of snow on the ground! I have made this recipe several times and it is in my regular summer BBQ rotation. No more boring chicken! It is perfect as-is, and really great with the rice pilaf recipe from this same site. It is a crowd-pleaser, everyone likes this chicken. I serve it with plain yogurt or tzatziki, hot sauce, the rice pilaf, grilled pita bread and grilled veggies. Oh and leftovers make a great pita/wrap filling! If these are broiled how long would you expect it to take? Our oven has two broiler settings one is broil High and one is broil low – does it make a difference which one I choose? And while broiling do I need to take them out to turn a couple times or can I just put them in the oven under the broiler and leave them for the requisite period of time? Finally, if broiled should the oven door be kept slightly ajar? I’ve seen some people do this. If cookwd in a stove top grill pan should they be turned? And how long do you think it will take for them to cook there? I’m advance thanks for your help. My friends have raves about this recipe and I am very excited to try it out. Hi Stacey, I’d probably use the broiler over a grill pan. Put your broiler on high and cook it for about the same time as indicated in the recipe – and you’ll need to turn it occasionally just as you would on a grill so that it browns evenly. I usually keep my oven door open when using the broiler so that the oven doesn’t get too hot (in which case, the broiler switches itself off). Hope that helps! Thanks so much for your amazingly quick and thorough answer. The kebobs were absolutely delicious! I plan to broil the kebabs tonight. Can I use wooden skewers that have been soaked in cold water? I don’t have metal ones. Sure Carol, as long as you soak them first, that should be fine. Enjoy! These are amazing. The flavor is spot on. I did not change a thing in the recipe. Beware, if you make these you will be craving them again and again! Would it make much difference if I use red wine vinegar instead of lemon. I know its a totally different flavor profile but you stated the lemon would make chicken breast tougher?! Hi Laurie, that should be fine. Hope you enjoy! Sure, Laurie – you can broil them. Cook time will be about the same. Hope they turn out well! My family loved this recipe. It’s a keeper! I will keep it and make it again! Hi Vivian, If you can find a non-dairy yogurt in your grocery store, I think that should probably work here. Hope you enjoy! I would love to try this recipe, but I don’t mix dairy and meat. Can I replace the yoghurt with something non dairy? If yes, do you have any suggestions? Hi Miriam, although I’ve never tried it, I think this could work with dairy-free yogurt. I’d love to hear how it turns out! Hi Miriam – if you can get it in your neck of the woods, try soya cream – the lemon juice in the recipe will add the necessary acid to tenderise the chicken anyway, and the soy cream will help everything to coat the chicken, although it is not as thick as Greek yoghurt, of course. Let me know how you get on – I use soy cream a lot, as our granddaughter can’t have dairy, and it’s a really useful thing to have in the fridge. Can these kebabs be done in an oven? Yes, Alice, they can be broiled in the oven (for about the same amount of time they’d cook on the grill). Enjoy! Thank you so much for this recipe! I was so proud of myself for making it just how I expected. The ingredients were definitely on point. Yum! I am so satisfied. Just made this chicken recipe – swapped the breasts for chicken wings – just delicious! Very simple to make the marinade and amazingly tasty. Will definitely cook again, although may leave out the cinnamon. Thank you so much. I actually left out the cinnamon twice and it was not missed. Made this today and the pairing of rice and carrots. It was all fabulous! Husband loved. I used 2% Greek yogurt and ended up broiling instead of grilling. I was concerned because I used chicken breast with the full amount of lemon juice. It wasn’t tough at all but tender. I can just imagine how juicy it would have been if I had only used the zest. If I were to use the leftovers in a pita sandwich, any pointers on what to add? Hi Janet, I think hummus or tzatziki with sliced tomatoes and cucumbers would be great with this on a sandwich. Glad you enjoyed it! Hi Se, I’ve used sweet paprika, but you can use whatever you prefer. Hope you enjoy! I’ve made this recipe numerous times but recently decided to use the instant pot. My advice is to make extra sauce as the chicken will need to be fully covered. Go easy on citric acid as cooking in the instant pot will turn your kebabs into shredded chicken. This is absolutely one of our favorite family recipes. It is easy and delicious. I did replace the yogurt with non fat but other than that it is perfect. Can you use lactose free sour cream instead of Greek yogurt? Sure, Melissa, that should work! RE: Chicken Kabob recipe. If you do t have a grill, can this be cooked in the oven? Yes, Mary, I would broil in the oven them for the same amount of time they should be grilled. Enjoy! I have tried his recipe on the grill and it is amazing. I had a follow-up question about using a oven. At what temperature would you suggest to broil the skewers? Hi Monia, Glad you enjoyed it! My broiler is 500°F. Amazing! This is my husbands absolute new favorite dish! He requests is often:) Goes great with the suggested sides of rice and carrots too! Thank you Jenn! This recipe always turns out amazing, with rave reviews from my guests and family. Last time I made this dinner, I knew I would rushed for timing, so I cooked the basmati rice pilaf with dried fruits the evening before. When the chicken was BBQ, I reheated the rice and added the toasted nuts before serving, it was so delicious. I’d give this more stars if I could! This recipe is such a crowd pleaser, I’ve brought it to every potluck I’ve been to this summer! If you have smoked paprika on hand, consider swapping out a teaspoon of regular paprika for it! These are the best chicken kebabs I’ve ever tasted!! So juicy and tender. The flavours are incredible!! Hi Clare, sorry for any confusion; I mean the BBQ when I say “grill.” Hope you enjoy! Loved this chicken recipe just as it is! I have made it several times for my family and served it with the beautiful Basmati Rice Pilaf with Dried Fruits and Almonds pictured in this recipe. I changed the rice a little because my family does not like dried fruit. I added toasted coconut to the rice instead of the fruit. This meal is so delicious! These kabobs are always a hit on grill night and the rice is wonderful. Add a salad and you have a delicious meal. This is my absolutely favorite meal to make for guests – it is always a huge crowd pleaser. The marinade is deceptively easy – yet super rich in flavor. I make it with your basmati rice pilaf – adding golden raisins, almonds. I serve it with feta’d cucumbers and olives. Yummy!!! I’d give this recipe a 10-star review if I could. I’ve made this recipe many, many times and it is so incredibly delicious. I love this recipe. I cannot express how wonderful this recipe is! It comes together very quickly and was perfect as it allowed me to focus on visiting w/ our guests rather than being stuck in the kitchen. I did use chicken breast (personal preference) but the compliments this received…oh my gosh! The flavors are so bright and fresh. Try it with the rice pilaf….truly a match made in Heaven! Marinated this morning, and made the kebabs for dinner tonight – total success! We used chicken thighs, and indoor grilled on the cast iron grill on our new stove. The kebabs were DELICIOUS. Looking forward to the leftovers tomorrow for lunch. Thanks for a really yummy, authentic recipe. Hi there, Can I use a stove-top grill to make these? And if so, how would the recipe change? Hi Gigi, I think these would be better if broiled in the oven, but several readers have commented that they have made these on the stovetop and have been happy with the results. Hi Jenn, First off I have to say thanks for sharing your recipes! I have tried a few so far and let’s say they have become family favorites and now I have to stock up the ingredients so that I can make them whenever I crave for the dish. This is my second time making the Middle Eastern Chicken Kebabs. The first time I made this recipe I marinated for 6-8 hours and followed the exact recipe. It was delicious but I was curious to see how coriander would taste if it was added with the recipe. I’m still new and love exploring on the spices from Middle East. I notice that coriander is one of the few ingredients that comes up a lot. For this second batch I used ½ teaspoon of coriander and instead of skewering them and placing the sauce on the kebabs, I instead marinate the chicken in the sauce for 12+ hours. The following night I skew them in wooden toothpick since I couldn’t find my actual metal skewer and bake them at 350 degree for 30-40 minutes, rotating every 10-15 minutes. I opt in for baking because it was late at night and didn’t want to be in the dark grilling. There were liquids from baking so I had to pour them out from the pan each time I flip them over. I think the next time I’m going to try to grill instead. I had to bake the chicken in two separate batches because my tray was too small. After two hours of baking, I finally get to taste. I have to say I absolutely love the taste of the coriander added, it gave a hint of sweetness which I like! I was actually surprised. I am looking forward to trying it again with the coriander and hopefully grilling it the next time around! Jen, this recipe specifies metal skewers. Is there any reason I can’t use wooden? That’s all I have. 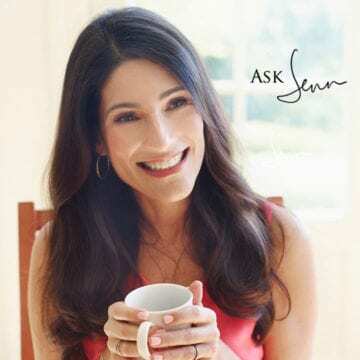 Hi Jennifer, Yes, you can use wood skewers; just soak them in water for about 30 minutes first so they don’t burn when you grill them. Can I make these in the oven? Thanks! Yes, Paj, I would broil them for the same amount of time they should be grilled. Enjoy! Wow! This reminds me of one of my favorite places! When I would travel to India, there was this amazing grill on the roof of the hotel where I was staying. They made some incredible chicken dishes on the open flame grill. This reminded me so much of those awesome delicacies! Thanks for providing simple, yet wonderfully delicious recipes! Delicious! I used four of your recipes to create the menu for my husband’s birthday party and these were delicious! I used both chicken breast and thighs, and both were good! I didn’t change anything from the original. I am having a family party for 10 and would like to make this dish (looks amazing) and add another ‘main’ to the menu…what would you suggest that would be a good fit with this? I just love your site and your recipies!! Hi Anne, My lamb kofta or Moroccan Meatballs would both go perfectly. I am wondering about using pork in this recipe. Would it work? I have a lot of cubed pork that I purchased that looks like tenderloin pieces. Hi Sheila, If what you have is pork tenderloin, I think the kebabs would come out a bit too dry (because the tenderloin has very little fat). Sorry! What is the rice recipe you serve this with? Hi Anne, It’s this one. Enjoy! These kebabs were a winner! Succulent and packed with flavor. Thank you! loved this recipe! 🙂 marinated the chicken for more than 24 hours and it tasted so good! Thank you Jenn for sharing your recipes! Delicious!! I followed the recipe and the chicken was out of this world. Two thumbs up! Hi, can these be done in the oven? Hi Allana, I’d recommend broiling it using a broiling pan. They should cook for about the same about of time that they do on the grill. Hope you enjoy! I’ve had this recipe saved since you posted it, but JUST came around to preparing it. I had a little less yogurt than needed and had to use up chicken breasts, but decided to stick with the recipe as is otherwise. I let the chicken marinate over night, and then I grilled baby bell peppers alongside and made a buttery basmati/onion pilaf (that delightfully became crispy on the bottom- pleasant surprise!). Opened a Sauvignon Blanc and I’m in heaven. I don’t have to order from a restaurant every time. Thank you for sharing this wonderful recipe. This was delicious! Unable to find boneless thighs, I used boneless breasts. In the marinade, I omitted the lemon juice (as recommended) and used a little extra zest. I added a wedge of lemon to each plate and we all drizzled a little juice on the chicken. I also added more onion since my husband is a big fan. Yummy!!! I made this amazing chicken this wee using breasts it was tender and moist and yummy! I cut them into strips and marinated over night in a plastic bag and then put on skewers. A new favorite in our home thanks! I also shared with foodie friends on Face Book! Hi Jenn- the recipe looks divine and on my must try list! I have a basic question about use of lemon juice in this recipe- I have learnt from some of your other recipes with grilled chicken (example: https://www.onceuponachef.com/recipes/perfectly-grilled-chicken-breasts.html) that the lemon juice tends to impart a leathery texture to outside of the chicken and it seemed like u were suggesting to replace with lemon zest for flavoring. I am hence wondering if the lemon juice is okay to use in this recipe though because we are using chicken thighs? Thanks so much!! That’s exactly right– because thighs are more moist than breasts, it’s fine to have lemon juice in the marinade. Hope you enjoy! I used strips of chicken breasts as that is what I had in freezer…this was amazing and NOT tough at all. Chicken loveliness if I do say so myself! Should I remove excess marinade from the kabobs before grilling or just let whatever marinade is coating them stay on. Making them tonight! Thanks. Haya, no need to remove any marinade from the kabobs but some excess may drip off when you remove them from the baking sheet. Hope you enjoy! These kebabs were Amazing. I only marinated them for 1.5hrs and they were still very flavorful. Next time I’ll plan ahead better and try the full 8 hours. I also broiled them on a cooling rack over a sheet pan and they cooked brilliantly. I love these flavors! Thanks for another great recipe. Great flavors, easy to whip together. I’m so happy I found your site! I’m planning to make these Saturday. I know they can be down in the oven on the broiler. I was wondering your thoughts on whether or not I should lay them flat on the sheet pan or use a grill rack? Thanks for posting such fabulous recipes. I plan on sharing your site with my girlfriends this weekend! Hi Yolanda, if you have a grill rack/broiler pan, I would suggest using that. Hope you enjoy! Thanks Jenn. I forgot to ask one other question. I’m using 4lbs of chicken. Should I double everything except the salt? Sure! And you can just add more salt to taste. Hi Jenn, I made the kebabs over the weekend and the came out fabulous! I used the broiler settting on high in the oven, with a broiler rack and they came out perfect. And you are so right, the thighs were so moist. This is the best tasting marinade ever! Hands down the best kebabs I’ve ever had. The meat was moist and flavorful, with just the right amount of spice. I skipped the onion but otherwise made the recipe exactly as written. Such a great and easy recipe, and so flavorful! My entire family raved! I generally don’t like dark meat (at all) but I took your advice and used chicken thighs and you were absolutely right – so delicious! Well worth the extra prep time. I made your basmati pilaf & curried roasted carrots to go with the chicken; the meal was a huge hit in our household 🙂 I used the broiler (weather wasn’t good for grilling) & the chicken worked out great that way. Thanks for the fabulous recipes! Hi Jenn, I have not tried this yet- Q for you first- As it reads, I thought letting the chicken sit in the lemon juice mixture overnight would make the chicken tough….not the case here? Hi Jamie, I’ve updated the recipe as I do think chicken thighs are far superior here. Thanks for pointing that out! This a monthly meal we make in our house. I absolutely love it. We serve with extra yogurt for dipping, homemade hummus and a couscous salad with mint. So yum! The cinnamon comes through nicely and it makes it so unique. Delicious meal. Very easy and quick. Great for a summer evening on the grill. So easy….soooo good! We have a favorite dish using pork called Spiedies. Mint is the killer ingredient in that. Wondering if mint would add anything to this? I’ll give it a try next time. if I don’t have time to marinate this will it be ok? I did it one time and marinated it and I loved it and I’m craving it tonight but don’t have the ingredients to make it ahead ( namely the yogourt). Hi Marie, This dish really does benefit from a long marinade. It will still be tasty, just not as much so. Hope that helps! Can this be prepared in the oven? Yes, I’d recommend broiling it. It should cook for about the same about of time that it does on the grill. Hope you enjoy! Does this work if I cook them in the oven? Definitely– I would recommend broiling it. It should cook for about the same about of time that it does on the grill. Enjoy! Absolutely delicious! The chicken was so flavourful and tender. My kids loved it too. Hi, thanks for this recipe. Just wanted to ask if i can use this marinade to make Lamb kebabs. If so, how long can i marinate the Lamb? Yes, Ces, I think this would work nicely with lamb. Like the chicken, I’d marinate them for at least 8 hours. Enjoy! Can I use regular plain yogurt (6% fat) instead of Greek yogurt? Absolutely loved this dish. Cant wait to try it with the rice. I made these on the BBQ for a lunch get-together – your Menu suggestions were helpful, I followed the Gluten-Free Dinner Menu, making this and the basmati rice pilaf and switched out the Roasted Carrots with Thyme for the French Grated Salad (rave reviews!) and dessert I changed it, I made a simple Chocolate Mousse in individual ramekins and egg-free coconut Macaroons – all turned out well and I could make most of it the night before. Thank you! My family loves this recipe. Since I use the broiler to cook it, I do not use the skewers. I just put the meat and onion on the broiler pan in rows. The recipe ALWAYS tastes great! Hi Heather, How long did they cook in the broiler and at what temperature? Thanks. Is this recipe good to freeze? This is such an incredible recipe. I discovered “Once Upon a Chef” by goggling for middle eastern chicken kebabs and this recipe popped up. I’ve been a fan of the site every since and this dish has pleased many at our outdoor BBQs. We serve it right off the grill into fresh grilled pita bread. Oh and always plenty of tzatziki sauce. One of my favorite recipes! Perfect as it is with no changes. I tried marinating the kabobs first & then skewering, but it was messy. Next time I will try to freeze marinated kabobs first & it might be less messy to thread. I think the marinade taste is stronger then when it’s applied after skewering. I make it with chicken breasts instead of thighs. Delicious served with Jennifer’s Basmati Rice Pilaf with Dried Fruit and Almonds. This looks wonderful! I was wondering if omitting the red pepper flakes just dimities the heat and the other flavors would be as good on their own? I really appreciate being able to ask recipe questions. Thank you!! A delicious marinade! I’ve made it often for guests and receive compliments and requests for the recipe. Jenn, is there a good alternative to outside grilling, such as broiling? I’d appreciate any suggestions. Hi Rosalee, So glad you’ve enjoyed this! Yes, you can definitely broil it and it should cook for about the same about of time that it does on the grill. I dont have kabob sticks so i just want to put chicken in oven on a baking sheet and i also used beef should I still broil it? If not what temperature should I cook it at and what time? Hi Jessica, you can definitely broil them! If you’ve got one, I’d use a broiler pan. The cook time will be similar to that of the grill. Enjoy! Can this be made in the oven? If so, at what temp and for how long? Hi Eric, Yes, you can broil the kebabs in the oven. (Use the same cooking time as the grilling method). Enjoy! Turned out great. I had nonfat greek yogurt so I added some extra olive oil. My son the culinary student has been telling not to use white meat for this. Finally listened and it turned out great. My son made the rice pilaf with it which was also great. We only had dried cranberries on hand but still a great flavor. Have not tried the salad yet. We have made your buttermilk chicken tenders many times but this is healthier. We will be making this to try to use up the lemons on the tree. Thanks for the excellent recipe, this is what I had been looking for. I tried it first time and it was hit with my family. Thanks again! Can this dish be made under the broiler or will the marinade cause too much smoking? Sadly, we don’t have a grill. Hi Linda, you can definitely broil them! The cook time will be similar to that of the grill. Excellent recipe! I doubled the marinade, using 1.5 teaspoons of chili flakes and 4 pounds of boneless, skinless chicken thighs and marinated it for 9 hours. Delicious but next time I’ll use the full amount of chili flakes. 6 diners, which included three young, big eating men. There were minimal leftovers and rave reviews. Served it with the Basmati Rice Pilaf which was perfect. Doubling it was TOO much rice however the flavors were stunning with the dried fruit. Thank you for another winning recipe. My husband and I love trying out new flavors and this did not disappoint. The only thing I did different was not put it on skewers. Used sauce and laid thighs on baking dish and baked in the oven. Used Jenns recommend couscous with apricot sauce (also amazing) and they paired beautifully. I added sautéed asparagus to the couscous and the whole meal was great and had leftovers. Made these tonight as written with thighs and vegetables grilled on side ( onions, zucchini, mushrooms, yellow peppers) and a BIG hit with my super picky Armenian BF – so tasty and moist and perfect with fresh pita and simple salad – just delicious! Thanks for making me a better cook – I love all your recipes and so does he! Very, very good. I use a mix of thighs and breasts and my family likes dark and light meat separately. Additionally, I have used regular whole milk yogurt (not greek), and they have been just as delicious. I’ve made this several times (with no adjustments) and it always comes out great! I don’t currently own a grill and broil them instead. Really tasty with the Bulgur Salad with Cucumbers, Red Peppers, Chickpeas, Lemon and Dill (also on this site). Thanks for an easy dinner combo! I have made this recipe numerous times for family and friends and love it! My guests have often asked for the recipe. Best kebabs EVER! Used with both chicken and lamb, and even non-lamb eaters loved them. The group I served ate half again the amount I figured. These were delicious! I cut the recipe in half for 2 of us, and accidentally used 1 TBSP of salt and it was still delicious! I used non-fat greek yogurt, and it was still full of flavor! I will definitely make them again! This recipe is delicious! The only thing we do different which only started by accident is that we use vanilla Greek yogurt. Sounds weird but my husband didn’t realize he had bought it instead of the regular and we used it anyways. We’ve made it with regular as well and it’s still great! Middle Eastern and obviously have no idea how to prepare this dish. This recipe is missing Tumeric by the way. Good recipe, but not the middle eastern way. My husband is Persian and Turmeric is used in almost every dish. Thank you for pointing this out because I was going to add Turmeric and Saffron to this dish. Sure, steak would work here. Cook time would depend on desired doneness. This was such an easy amazing recipe and the rice was incredible. I made it last week just for us two with the thighs (from M&S) and I’m making it again tomorrow. My husband was very impressed. Can’t stop thinking about how simple but very tasty it was. I halved the recipe and we even had some left over for next day. My mum who was an excellent cook was from the Middle East (unfortunately, she died 8 weeks ago) but she would have adored these dishes. This is now one of my top ten ‘go to’s’. It’s easy and concise to read. I’m going to try some of your other recipes too. Thank you for your hard work. Good luck. Hi Mary, thanks for the nice words about the site! Yes, you can definitely marinate the chicken first and then thread it onto the skewers– I just thread then marinate, because I think it’s a little less messy :). Yes Theresa, that will work just fine! I had this craving for greek chicken kabobs. Unfortunately, this is a dish I had in another state and couldn’t quite find the same thing here. Then, I found this recipe. These are great last night at dinner and great for lunch today. I’ll be browsing your site for other recipes. Thank you! Made this last night with the basmati rice pilaf and the tzatziki. I couldn’t wait for the leftovers tonight. So delicious. Wonderful flavor. I didn’t have access to a grill so I put the kabobs in the broiler about 6 inches away from the heat for about 12 minutes – turning them once after 6 minutes. This is now one of my favorite meals. Best chicken ever! I’ve made it twice for different friends and all loved it. Very flavorful. Tender. Yummy hot or cold. Planning to make again. A little labor intensive (for me, cause I’m lazy). I used to hate cooking bc I had so many flops. Everything I make from your site is delicious. I actually am starting to become a better cook!!! Wonderful, simple easy recipe. I’ve made this twice now in ten days. I’ve been doing shish kebabs for years and what I also do is skewer zucchini, onions, tomatoes and mushrooms separately and grill before the chicken. Great meal with rice, Thanks! So good and tender! Husband loved it! I’m making this for dinner tomorrow night (having a couple over). I’m planning to serve fattoush alongside it and my girlfriend is bringing a couscous dish. I do also want to make your couscous, Jenn, and will next time. I’ll be sure to report on the kebabs. Can’t wait! I made this for a Father’s Day BBQ. My father is from Beirut and is great at making shish-ka-bob, but I have always thought that his meat was a little too dry at times. This recipe makes the meat so, so, so tender because of the yogurt. It was a huge hit at the BBQ. The only problem was that I didn’t make enough. Great recipe! Hi, I don’t have a grill and will have to make these in the oven but I can’t figure out the broiler function. There are three knobs on my oven: one for temperature, one for the heating element (only up/down or both) and one for the time. Please help me with this. Hi Salma, You mentioned that you have a knob for heating element. Choose the “up” heating element as it sounds like that would be the broiler. Hope you enjoy the kebabs! Can you also tell me how long and at what temperature I should make it? This was a great dish! Most of the items are easily found in your kitchen, so it’s not like you need to buy special items for this recipe. Clean flavors with simple ingredients. I was a little concerned that it didn’t have a sauce to go with it, but you didn’t need it at all. I only marinated the kebabs for 2 hours, and it was still nice and moist on the grill. Perfectly moist flavorful chicken. I followed the recipe and the whole family loved it. If you like spice the crushed pepper flakes are a great treat! Amazing recipes as always. Thank you! Hi Julia, the meat only marinates on the foil, but is cooked directly on the grill (and the foil is used just for easy cleanup)! Hi, I’m very concern on what is the proper way to grill. I don’t want to burn it. Can you give me any tips? Hi Liezza, I think this article has some great advice for grilling. Hi, I don’t have metal skewers. Can I marinate the chicken overnight on the wooden skewers in the fridge? Yes Stefanie, just soak the skewers in water for about 30 minutes first so they don’t burn when you grill them. This recipe is one of my all time favorites!!! Must make the Basmati rice too! any suggestions on how to simplify preparing the basmati rice for 40 people? Cook it in a slow cooker? Hi Laurie, I’m not familiar enough with a slow cooker to say if that would work. For that number of people, you could either use a giant stock pot to prepare it, or make a few batches. It reheats nicely in the microwave. Would I just triple/quadruple etc. the ingredients in using a stock pot? Exactly! Please let me know if you have any additional questions. Can I put some of the red onion in the marinade because I don’t have a grill. Going to use the broiler method ? Hi Salina, you can include the red onion on the skewers even if you’re using your broiler! Of the best things I have ever cooked. To get your attention but not really spicy. It on the scewers before cooking and added some red and yellow peppers. It was a real taste bud feast. Yes Pam, I think the marinade should work nicely with lamb. I’d love to hear how they turn out if you make them! just curious are you middle eastern?? because it truly doesn’t seem like you are and this recipe is absolutely not . I am Persian from Iran and have been cooking this food for years and that is not the way its done. For future reference cooking ethnic dishes should be kept authentic and the same as the original recipes. It doesn’t really matter if she is Middle Eastern or not. This is a great recipe that uses Middle Eastern ingredients. If you don’t enjoy it, that is fine. No need to make a big deal out of it. That kind of response should not be tolerated. If you don’t like the recipe then keep looking. No need to bring race into it. We are all just human. Light, love, peace. Uh-oh, I made some Italian meatballs the other day and I’m not Italian! I hope the ARP (Authentic Recipe Police) don’t come after me! ? Perhaps you could include a link to an “authentic” recipe? There are regional variations within countries on many dishes. I’m not saying you are not correct, but it just seems pointless to offer only criticism. People who visit this site are looking for delicious , perhaps new, recipes to try. This should be an enjoyable experience . My husband and I really enjoyed it and will be making again. Authentic or not ! I made these kebabs and the basmati rice this weekend! They were SO DELICIOUS, FLAVORFUL AND TENDER. I would totally make these again. The rice was so fragrant. I used raisins instead of currants as they did not have them at my store. My family loved this chicken (and whole meal, see below). I live in LA and there are many Persian markets here. I have a (Persian) friend who owns an organic Persian inspired restaurant (well, I think there are four now). She told me how to make this chicken using a spice mix from the Persian market (probably for simplicity sake, she told me the recipe while we were sitting at the beach). This recipe is the homemade version of what I made from packets, lemon, yogurt and all. I added more lemon juice and lemon zest than recipe called for because this is what I did when I made it with the packet mixture. I also made the rice shown in the picture but substituted brown basmati for white. I made a kale, golden raisin, slivered almond salad with champagne vinaigrette that I sort of copied from a local restaurant. The whole meal was s huge success. Sounds delicious Debbie– thanks for sharing! I’m wondering if you can bake these kabobs or cook on a griddle? We are making these in a vacation home that does not have a grill. Also, where can I find the rice recipe? Hi Jill, you can broil the kebabs in the oven. (Use the same cooking time as the grilling method). You can find the recipe here. OK, I followed both the kebabs and basmati pilaf recipes word for word, the outcome was that I looked like I could cook! I texted friends, family…everyone saying “I made a recipe, and it worked! And people ate it!” haha! Everything was so delicious my son and husband had 3rds – my son is so picky too – I cannot believe it went over so well! It was my first time on the website and first time using a recipe from your site 🙂 Thank you so so much! The tips on trimming the thigh meat were very helpful. It worked like magic – especially for someone who really can only cook by following recipes! Score! Hi, this recipe is great! Can I make this in the oven if I don’t have a grill? Yes, absolutely — you can broil them. Cook time would be about the same. Can I use regular yogurt instead of Greek yogurt? Will it make a difference in taste? These were SO delicious, and SO flavorful. I’ve been looking for a good kabob recipe for a while, and this one knocked it out of the park! I made it with chicken thighs and breasts, and both were great. Thanks! This middle Eastern kabobs are really good. Please try them- so easy to make. Thank you for this recipe. I made this tonight and we absolutely loved it! I just wanted to let you know your recipes have improved our meals at home over the past few months. I started with your Guinness Lamb Stew with Veggies which was out of this world and I have made if multiple times since! We also love your Spicy Chicken with Sweet & Tangy Honey Glaze which I pair your your Roasted Broccoli with Chipotle Honey Butter. Again, this recipe was not surprisingly, easy to prepare, unique, cheap, beyond delicious. THANK YOU! Excellent! My brother made this for our family and we were stunned. So flavorful!~ This recipe is now my go to for family dinners and casual dinner parties. It’s always a hit! This looks delicious! I am always trying to find intriguing new recipes for chicken! Thank you for this! These are easy to make , on the grill or oven. A different and delicious way to have chicken for dinner. Where is the recipe for the rice? I don’t have a grill so I cooked these in the broiler. They came together very easily, and the most time-consuming part was trimming the chicken thighs. Another hit with the entire family, including the little ones. I served it with the basmati rice in the picture, and my 8-year-old asked for seconds of both the chicken and the rice. Thanks for the amazing recipe! Hi Annette, They are meant to be cooked on the grill and, yes, wooden skewers are fine; just soak them in water for about 30 minutes first so they don’t burn on the grill. Why place the chicken in a baking sheet if you are baking chicken. You are grilling the chicken so why the baking sheet and foil? Hi Frank, Good question — it’s just for easy clean-up. Hi. I can’t mix dairy with chicken, istha wayo make your Middle Eastern Chicken Kebabs without the yogurt? dairy free? Hi Sharon, Unfortunately, there’s no substitute for the yogurt in this recipe. Sorry! Coconut Cream: Allow a can of full-fat coconut milk to settle (about 1/2 hour). The coconut cream will rise to the top and can easily be skimmed off. Depending on your needs, coconut cream can substitute yogurt nicely using a 1:1 ratio. Pureed Silken Tofu: Medium Firm Silken Tofu will puree into a nice consistency, and may substitute yogurt using a1:1 ratio. Obviously, this sub is only for recipes, and since it does lack the tartness of yogurt, it is most suitable for “heartier” dishes. Looking forward to serving the Middle Eastern Chicken Kebabs this weekend to guests. The reviews are fantastic. I will definitely serve it with your suggestion of Basmati Pilaf with Dried Fruits and Almonds. I was thinking of a side salad of greens and have a terrific Thai Mango Salad recipe, do you think they would work together nicely or do you have another one or two suggestions of side greens or veggies? Many thanks! This is the first time I will be serving something from your repertoire and so looking forward to it. Wow! Thanks so much for your input and suggestions! Decisions, decisions! I love the sound of all the options you outlined and have all the makings in the fridge for each. I am leaning toward the cucumber salad, I will let you know how it turns out! Thank you so very much! The dinner was wonderful! Thank you! I ended up by serving the cucumber salad which was delicious. The rice was superb! Next time I’m going to try chicken thighs but the chicken breasts for the kabobs was lovely as well. Thank you so much! I made these wonderful kabobs for a summer ladies luncheon with my dear little aunts and my sisters. I used good quality chicken breast from Trader Joes and marinated for 24 hours. We served them with a lovely Greek salad, with fresh hummus and pita on the side, along with grilled vegetables seasoned with kabob spices. Tzatziki sauce complemented the chicken so nicely. Everyone raved about these, and they immediately went into my recipe favorites! This will be my go-to recipe for kabobs, as good as I have had at any Mediterranean restaurant. This have become my go to chicken recipe when I am having a casual dinner party. I always get great compliments when I serve this! The only change I make is the use of smoked paprika, which adds a wonderful smokiness. I also marinate the chicken in the yogurt sauce before threading it onto the skewers. I find that 8 hours is plenty of time to give the chicken that great flavor and succulent texture. I serve it with a couscous salad(couscous, tomatoes, cukes, feta, fresh herbs, with a quick lemon vinaigrette), roasted veggies and simple green salad. So easy! I especially like that this menu allows me to enjoy my guests! Hi Jenny – I have to cook for 30 people and I want to make your Middle Eastern Kabobs and Basmati Rice (looks amazing)….any tips for cooking these recipes in bulk? I’d appreciate all thoughts…thank you! Hi Susan, The chicken should be no problem to just increase the quantities. The rice will be a little trickier; unless you have a huge pan that can go in the oven, I would probably cook it in a few different batches so that it cooks evenly. This is officially one of the top 5 requested recipes I make at home. The only change I make is to double or even triple the garlic, and I use a garlic press to save time and infuse even more of that garlicky flavor into the meat. Marinating for 24 hours makes all the difference – 6 or 8 hours just doesn’t deliver the same flavor. I’ve done this with breast meat which is easier to cut and put on kabobs, but thighs really do deliver the most flavor. We always thread zucchini and onions with the chicken, and serve it with the basmati with currants and almonds recipe pictured. Excellent recipe. This recipe makes the chicken taste restaurant style but with an even better char. This recipe was very inexpensive to make since I had everything on hand except for the yogurt which is great when feeding a big family. I would recommend this recipe to anyone who is looking for a Greek chicken recipe for a gyro or played with rice. I have made this recipe twice now and it is absolutely fabulous. I make Greek tzatziki to go with it and I have used the chicken to make pitas. I also made the rice pilaf shown and it is great. Yum, yum, yum! My family LOVED the chicken kebabs and the rice! Both turned out to be delicious! I struggled a little with the kebab grilling process and it took longer than 10 min to grill them. How do you make sure that the chicken pieces are grilled evenly and the middle part around the skewer is not raw? Thank you so much for great recipes! They are keepers in my book! Hi Elena, Glad you enjoyed! The cook time will always vary a little on the grill, as all grills are different. It’s best to keep the lid on though, so the grill stays nice and hot. Another wonderful recipe….the kebabs and the rice were fabulous. Just love your recipes Jenn! Keep em coming! If I don’t have a grill, for the bet result, would you suggest using a large grill pan on the stovetop or broiling? Thanks! Hi Rachel, I think broiling is best. Enjoy! Wow! Delicious! This is the 4th recipe I have made from Jen’s website since discovering it last week. They have all been amazing. My husband and toddlers loved her middle eastern kabobs. Please Jen, more recipes! I’ve never broiled before and I would like to try this recipe by broiling it. Can you please let me know what degrees I need to have it on and for how long? Do I need to take the chicken out and turn it while broiling? Hi Maria, I would set the broiler on high; cook time will be about the same. Definitely turn the chicken so it browns evenly. These are the better than my favorite middle eastern restaurant make. Very flavorful and juicy. I followed the recipe exactly except I added more pepper flakes. Thanks. Delicious! My husband (who is quite picky and doesn’t like chicken) LOVED it and said its the best chicken he’s ever made. My 12 year old son raved and even “took a moment” to really take in and savor how good it tasted. I was out of Greek yogurt and used sour cream instead and it worked great. Thank you for a fantastic recipe! Jenn, All of the recipes I’ve tried of yours is wonderful! I’ve made this several times and everyone always likes. I’ve made with the basmati rice too – so good. I actually just put this into a crock pot – to see how that will go! Thank you for what you do!!! I tried this today. Delicious. Could this marinade be used with lamb? Hi Stan, I do think that would work. I have a question about the Middle Eastern Chicken Kebabs. I’d like to make these for dinner for someone special. However, I can’t grill that night and have to bake skewers in the oven. What temperature and time do you recommend? Thank you for making the note about using thigh meat versus breast meat to retain moisture. I don’t want dry kabobs! The marinade looks delicious. Thank you! Hi Swati, I would broil them instead of baking for about the same amount of time. They will turn out great. This recipe is amazing. I live near “Tehrangeles” and my BIL said this is better than most of the restaurants around us! I add a little more lemon juice, and I use my broiler since I don’t have a grill. Needless to say, I’ve made this quite a few times. Thanks, Jen! I have been loving this site since I happened upon it. I regularly share it with my co-workers. I think my top 3 loved recipes is this, the black bean and corn salad, and the crab cakes. The are all super simple to make. My goal is to try as many recipes as possible. Thank you so much for perfecting these recipes and sharing them with us. This is an excellent recipe, as it can be prepared ahead of time and has wonderful flavours. I have made it many times, accompanied by the basmati rice that you suggested, another great recipe. The yoghurt marinade also works well with lamb, so when we have guests over I often make chicken and lamb skewers to cater to all tastes. I made this recipe for our family Sunday lunch. It was great!! I used small pieces of chicken breast instead. The chicken was very tasty and the rice was perfect. I served it with that awesome rice on this site and with homemade hummus and veggies and pita bread. Delicious! My picky fancy pants husband said it was his favorite meal he’s had in a long time. It rained in DC last night but I was determined to try this and it did not disappoint. My poor husband was in the rain working the grill but he said it was totally worth it! I just have one question, I thought the kabobs needed some type of sauce, do you have any that you can recommend ? Thank you for your prompt reply. I will certainly try this. All the best to you and your family ! PS….love your recipes ! This is my go to site ! I used the chicken breasts that I had on hand, sour cream instead of Greek yogurt, a pinch of cayenne and since it was pouring outside, I ended up having to broil these (for ~20 min). Still came out tasting great! This Recipe sounds perfect ! I just want to know if I can marinade the chicken and freeze it for about 3 weeks to cook on my daughter birthday party ? I am a little hesitant about freezing chicken in a yogurt-based marination . Hi Mariam, I think it will fine. The yogurt might separate when you defrost it, but that shouldn’t affect the end result. The recipe was great! Really flavorful. I paired it with a jalapeño cilantro lime hummus. My issue was i lacked greek yogurt and was in a time crunch. I subbed mayo, less than 1/8 cup. 2 reasons for the small amount 1) i feared the flavor change 2) that would be a crazy amount of mayo. The spices were really concentrated but it worked! Thanks for the recipe, ill try it for real next time! This chicken is amazing, I have made it almost every week since I first found it. I wanted to know what is the longest period of time that I can keep it marinated? Is 2 days too much? Thanks! Two days is fine but I probably wouldn’t go any longer. Any suggestions if you don’t have Greek yogurt stocked in the house? I was thinking of trying sour cream… I know it’s more fat but kids are napping and trying not to run to the store. It was still amazing! Can’t wait to try it without the substitution. Thanks! Made the marinate but used it on salmon instead of chicken. It was fabulous! Served it with basmati rice pilaf with dried fruit and everyone loved it. Thanks for this recipe, I will try it with chicken next time. I just wanted to say thank you soo much for your sharing your recipes. I love this recipe with the basmati rice, tzatziki and homemade naan. You are now my go to girl! I made several types of kebabs for a party: lamb, beef, chicken. They were all pretty good, except everyone kept talking about how good the chicken kebabs were! Chicken was super tender and full of flavor. The recipe is so easy. I only marinated mine for 3 hours and still were delicious! Make this today! This was amazing! It was a perfect, simple yogurt marinade, and the chicken thighs were the right choice. I bought enough chicken that it was supposed to last me a few nights of meals, but between my mom jumping in on it, my brother breaking his dairy-fast to snag some, and my inability to quit scarfing it down, it barely made it through the evening… I will definitely be making this again! This was delicious! You can really taste the lemon juice. I added mushrooms and yellow squash to the kebabs & served with Trader Joe’s Naan breads. Will be adding this to my favourites!! Made these in broiler. I doubled everything to make sure to had enough. I marinated chicken and red onion chunks in pan in fridge overnight. Then threaded on skewers right before cooking. I thought they would cook quickly under 500 degree broiler but could not get a thermometer reading over 140 for 25 minutes. I am wondering if the amount of chicken vastly increased cooking time or did I perhaps put too much on each skewer? The texture of the chicken was wierd (husband bought at walmart so quality is questionable) but flavor was divine. Any thoughts? Hi Melanie, Sometimes when a broiler gets too hot, it self regulates by turning off for a bit — that would definitely increase cooking time. That shouldn’t affect the texture of the meat though. More likely the chicken was frozen too many times and/or not defrosted properly. Just made this for my family. I needed to make extra, it was so popular! So very delicious and I’m sure it will be requested frequently. Pic looks so delicious. I will make it in the oven. Can you please tell me what will be the oven temperature and time? And do i have to set it in ‘bake’? Thanks! Hi Moon, I would broil it. Set your oven rack about 4 inches from the heat source and broil, turning a few times so the kebabs brown evenly. Cook time should be about the same. No kebabs, I just cooked the chicken thighs whole but followed the recipe. The chicken was delicious and my wife and 2 small kids loved it. One thing, I added a little sea salt before the thighs hit the grill and served with a side of saffron rice, pita, and greek yogurt sauce (olive oil, garlic, mint, grated cucumber, lemon, and salt). Thanks Jenn. Do you think you could use this marinade for veggie kebabs, for my vegetarian friends out there? Would it taste good with tofu or chunks of zucchini/onion/artichoke or something? Hi Sarah, Yes, I think it’d work well with veggies and tofu. I don’t have a grill. Can I cook this in my oven or the broiler of the oven? If so how long should I leave it to cook for? Hi Summer, Yes, you can use your broiler. Set your oven rack about 4 inches from the heat source and broil, turning a few times so the kebabs brown evenly. Cook time should be about the same. Can I use something vegan instead of greek yogurt? Trying to keep this kosher, thanks!! Hi Jess, I have never tried vegan yogurt so can’t say for sure, but I do think it would probably work. Try onion and onion juice instead of yogurt(the white extract that comes out of the center of the onion not from juicing the peels). Chop up some LARGE white onion in the same plate you intend to marinade the chicken in over night. This way you won’t lose the juice on your cutting board. I also add some chopped green pepper and 1/2-1 tsp turmeric for a more Middle Eastern flavor. What I like to do is to marinade first and then thread onto the skewers without the onion and pepper, since they tend to burn before the chicken is ready. Hi jennifer, do you think this will work with 0% or fat free Greek yogurt? Hi Jennifer, It will work, but won’t be quite as rich and flavorful. Could you use 2%? Excellent! I made it without time to marinate more than 30 minutes, then cooked under the broiler, but it was still wonderful! 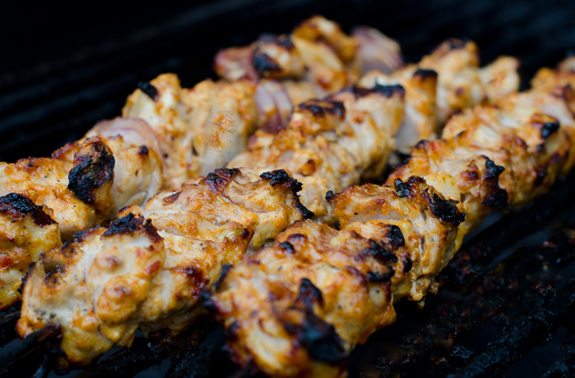 Is it safe to leave raw poultry on a metal kabob stick over 8 hours? Hi Joan, Glad you enjoyed! What is your concern with the metal kabob sticks? This recipe is fabulous! The second time I have tried it, I chose lime instead of the lemon and it worked quite good adding a more oriental zing. Thank you for the recipe! Oh my! Just made tonight for my husband and I and he couldn’t stop complimenting on the wonderful flavor and tenderness. I also used boneless chicken thighs (I prefer Brest meat, he thighs). His birthday is coming up and begged that I make this for his birthday dinner. Thank you!! Oops. 5 star for sure!! I absolutely love this recipe. I wanted to try with lamb loin chops. Do you think that would be good chef? Hi Lauren, I do think the marinade would work well with lamb. Please come back and let me know how it turns out. A very good recipe, i’ll definitely be using it again. Thanks for sharing this recipe! Oh my goodness, this is an amazing recipe! I marinated the kabobs for only 4 hours, and they were spectacular. The only comment that I have is that the recipe made less than I expected. I used about 4.25 lbs of chicken, and I ended up with 9 kabobs. Otherwise, this one is a keeper! Hi Amanda, Beef should work just fine. Please let me know how it comes out. Yum!!. My kids who are picky eaters loved the kebobs also. I followed the recipe as is except I didn’t add the cinnamon and substituted garlic powder for fresh garlic. This recipe is a keeper. Thank you for sharing. Tried this recipe tonight and I have to say it tasted just like the kebabs I ate in Dubai. Thanks for sharing the recipe! Oh my this was AMAZING!!! I was looking for a recipe similar to Dream Dinners’ Terracotta Chicken and this sounded pretty close. I tried it with whole boneless skinless chicken breasts on the stove and it turned out amazingly, though the yogurt burned and smoked pretty badly. Next time I’ll do it on the grill as suggested, and will pound out the breasts beforehand so they don’t have to cook so long. The chicken was juicy and so flavorful and was the star of my Mediterranean inspired meal. Served it for guests and everyone loved it! 1. What is Max amount of time you’d want to marinade this? Put it in fridge today at 330pm and won’t cook until 630/7pm tomorrow night. 2. Can I broil instead of grill? Don’t have access to one right now. Thanks so much, looking forward to this meal & love your website! Hi Elizabeth, It’s fine to marinate for that long and, yes, broiling will work. Hope you enjoy and please come back and let me know how they turn out! Wow…I mean, seriously…wow! I made these under the broiler. Also made the Basmati Rice Pilaf. My SO and I literally had to make ourselves leave the table. SO good! We don’t have a grill. How would I cook these in my oven/broiler? Hi Janet, You can use your broiler. Set your oven rack about 4 inches from the heat source and broil, turning a few times so the kebabs brown evenly. How long would you broil the kebobs? Hi Maureen, I’d say about 5 minutes per side for white meat. This is one of my favorite recipes! I omitted cinnamon and added garlic powder. The marinade had a lot of flavor. We made pita sandwiches with tzatziki sauce with the leftovers. Easy, flavorful and impressive. Be sure to try the suggested sides too. I came across your website when I googled yogurt marinade for chicken 2 weeks ago. I have made several of your dishes and am so satisfied with the results, and have been raving about your site. So my first recipe that I made was Middle Eastern chicken kebab. I’ve made it 3x in 2 weeks. I marinated it for different amts of times and the overnight marinade resulted in beyond raving comments from my 4th of July guests. Prior to that time, I was rushing and only had 4 hrs to marinade, and it turned out bland. So definitely allow the marinade to flavor the chicken overnight. Also, I was torn between, thighmeat vs boneless breast, and The breast was the juiciest that I’ve ever had! I think the yogurt is the secret in the moisture. 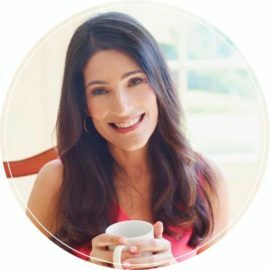 I gave all credit to you and spread your website to my guests. Everything that I make from your site is amazing and I see it with all the compliments that I get from my guests. I’m on everyday looking for new recipe to make. I thank you so much. This dish is so good. It is true about making extra, it goes. Another amazing recipe! Every recipe we’ve made has been delicious, we actually did a combo of kebabs and chicken wings with this marinade and it was all delicious! Followed direction as stated. Turned out excellent. I marinated the skewers for 24 hours. Just make sure you leave a little space between the chicken pieces. I put a couple pieces of the red onion between each piece of chicken. Served over Basmati rice with diced unsalted almonds and cherry craisins. Thumbs up! Winner! Excellent recipe, tried with chicken breasts. I understand that breasts can be very dry if cooked for long and chewy, but mine turned out to be very juicy and tender and very delicious. Next time I will try with the thighs and see what the difference if there is. Nevertheless its a very good and simple to follow recipe, cant fault it. I am very strict at ratings but this definately will score a 5 star. What if I want it for 10 lbs of meat, how would I change the recipe? Hi Zirley, No need to change the recipe; just multiply as needed. Hope you enjoy it! I have made this recipe at least a dozen times now, and each time I have created new fans of this wonderful and foolproof dish! I rarely make kebabs (too much work), so I just marinate either chicken breasts or chicken thighs. I usually serve this meal with naan, cucumber/tomato/onion salad, and a yogurt dressing. It’s superb as is – congratulations, Jen, on another winner! I would like to make this recipe for a party I will be catering (I am not a real caterer but people like what I do) I would like to make them the night befor and re-heat them at the party. I would not like to use skewers but stirfry on the grill and then offer them with pita’s ,kind of like a Gyro. do you think this would work or be too dried out. I would heat them in a covered foil pan in the oven at a low temp. Hi Joanne, I think that would work great — the chicken thighs are so juicy, they won’t dry out and will be delicious reheated. I think gyros are a wonderful idea. Please let me know how it all comes out. I fell in love with Kebabs at The Panini Cafe in Aliso Viejo. While driving home to Northern California, I googled recipies and found your website. I made your kebabs tonight (with only 1 hour of marinating) and they truly are the best chicken kebabs I’ve ever had! My family was delighted. Thank you! For someone that eats Mediterranean food regularly, this was absolutely fantastic! I only had time to marinate for an hour, but I can’t wait to try again with marinating over night. Thank you for such a wonderful recipe! This kabob together with the pilaf was FANTASTIC! It was an absolute hit at our home. Thank you so much for this recipe. We were at a loss as to what to cook for a soiree…found this, followed the recipe but had to omit the red pepper flakes (as one of our guests can’t tolerate chili). Marinated for a good 8 hours, grilled the chicken kebabs and served them alongside some colourful vegetable kebabs with various rices and a salad….result was stunning!!!!! Can’t wait to cook them again, this time with the chili flakes. Thanks again! Had a craving for chicken kabobs, grilled them. Although, recipe called to marinate about 8 hrs, which I only did for 20 minutes and they were awesomely delicious. Yummy…..
My family absolutely loved it! I used thighs and followed the recipe and directions exactly. Grilled them after marinading them overnight. Even my little ones and their super picky uncle loved the chicken kabobs. Thank you! Hello! I want to try this recipe but am wondering if I can cook it in the oven instead? If so, at what temperature and for how long? Also, would wood skewers work instead of metal? Hi Marlee, Yes that would work fine. I’d broil them about 6 inches from the heat source, turning occasionally, for the same time the recipe calls for. Please come back and let me know how they come out. Outstanding! Instead of grilling kebabs, I spread it into a single layer on a large baking sheet, tucking red onion wedges all around here and there. I then roasted it in the oven at 500 f, and it got a little charred just like in your picture. So good! I’m now considering using this recipe for a graduation lunch serving 50+ people. They can make their own sandwiches in pita, topped with red onion, tomato, cucumber, and sauce, with falafel as a vegetarian option. OH My GOODNESS, THANK YOU FOR POSTING THIS RECIPE!! This was amazing!! I had it with hummous in pita bread with salad – absolutely devine!!! I cooked half the chicken straight away in the oven and the other half after I had let it marinade overnight. Both were tasty. AMAZING! This was sooooo good! I might use rosemary stems as skewers next time. My kids LOVED it too. Can’t wait to eat it in a shwarma tomorrow! I followed this recipe to a tee. I did have to bake it. Awesome, awesome! We ate the leftovers with some homemade Greek potatoes, and naan with homemade tzatziki sauce. Yum! The Middle Eastern Chicken Kebabs are fabulous and fool proof. When served with home-made tzatziki and Greek salad and a little rice or couscous, they are perfect for dinner parties and seem much harder to prepare than they are. I’ve served them to guests now three times in three weeks–always to rave reviews! This one is bookmarked. Once the grill gave up and I finished them under the broiler, which was fine too. Just wanted to let you know that I made this (with the amazing rice) and it was a huge hit with my whole family, including two somewhat finicky preschoolers. Due to some scheduling conflicts, I was only able to marinate it for about four hours… I can’t wait to try it after giving it the full overnight treatment. I found your recipe via pinterest, and I will be back to check out the rest! This is so amazingly delicious! I added ground coriander to the marinade and added some red bell pepper chunks to the skewers, but otherwise prepared just as the recipe said. Served with basmati rice and yogurt sauce. YUM! I don’t have a grill and want to know the next best way of cooking them on the skewers?? They look so good!! Hi Emily, You can bake them in the oven and then flash them under the broiler at the end to give them some color. They will still be delicious. This chicken is fabulous! It was really easy. I prepared it in the broiler. I can’t wait until the weather is warmer so I can try it out on the grill. My whole family loved this chicken. I served it over rice pilaf. It is easy to prepare and a crowd pleaser! Made these for a picnic this summer and they were so good. Love the tangy taste. Added cherry tomatoes as well and served over white rice. I am thinking how delish it would be in a salad. Will try this soon. Thanks for an awesome and easy recipe. Note to self: do NOT think lemon salt will work. Too salty. Too fake lemony. Love this recipe. Thank you. These kabobs are in our normal dinner rotation. I usually marinate meat for 1 hour due to schedules. It still tastes great! This is so good! I cut the recipe in half to serve my husband and myself. Otherwise, followed recipe exactly. Served with white basmati rice, tabbouleah, the hummus recipe from this site (which is also good!) and pita bread. My husband loved it and wrapped it up in the pita bread with the hummus and tabbouleah I served. It is also good cold the next day! I made this with your basmati rice pilaf last week and we loved it so much that I am making it again tonight. I used chicken breast and marinated it overnight. Delicious flavors! This tasted so good that after I ate it I had nothing else to look forward to in life. This dish ruined my life because it was too good. You can also use lamb. Try it out. It was wonderful. I made no other adjustments other than using “country style traditional” Middle Eastern yogurt which I purchased from a Middle Eastern Grocery. I also cooked the lamb kebabs (the first time) over a campfire after making the marinade the nigh before leaving on the trip, so it was about 30 hrs of marinade time. Great suggestion, Jerry. I can’t wait to try that myself. I found this recipe on a google search. It looked enticing. Prepared and marinated last night. The only change I made was using Spanish smoked paprika dulce. Used the bbq tonight in between thunderstorms here in the UK. The family loved it. So I’m adding it to my small repitwar of dads meals. I’m now browsing your site for my next one! Hello Jenn – This is the 2nd time I’ve made this for my family and it was a hit. In addition, I made the rice pilaf today and it was a hit as well. Thanks. I will be trying the Peruvian chicken and green sauce recipes soon. Hi Jennifer. I just love your recipes and the occasional pix of your kids. Do you have a recipe for black bean cakes? We used to get wonderful ones at The Tobacco Warehouse in Shockoe Slip in Richmond. Do you have the recipe for the rice that is accompanying this chicken dish? Made this tonight, it was delicious. Thanks for posting, I’m looking forward to trying some other recipes on your site (which I came across for the first time today). Thanks again! So glad you enjoyed, Sarah — and welcome to the site! this recipe was spot on! I added some extra red pepper and thought I could have added even more! only marinated this for 3 hours so I’m sure it would have been ever better had I let it marinate for even longer! Pair this meal with some homemade tzatziki and everyone will be satisfied! I used chicken breasts instead of making kabobs and serviced with Jasmine rice, delicious! This was the first Kabob recipe I’ve ever tried and it was delicious. I did try it again without the Kabobs, becuase that was a bit time consuming for me. So I just marinated the chicken pieces and grilled them and served them with onions and green peppers it was just easier for me to omit the skewing step. Love this!! I use breasts, and I broil it in the oven without skewers. Still comes out amazing! I am pretty new to the cooking world, but as one of my resolutions for the new year, I sought to cook one dish that I have never made before every week. Well, about a month ago, I had a hankering to make a red spicy lentil soup and wanted a main dish to accompany it. I did some research online and came across this recipe and I am so glad that I did. It came out perfect on the first try! (Thanks to your step by step recipe of course). In any event, I did not have any skewers, so I just threw in the chicken and vegetables (I added green, orange, and red peppers) all into the yogurt spiced mixture and put in the fridge overnight. The next day I cooked it on my grill pan on the stove and it was delicious! So bold and flavorful! Needless to say, your website has encouraged me to fulfill my new years resolution with ease and all in all, inspired me to cook at home. So, thank you, and I look forward to making more of your dishes! I tried this recipe and it was delicious! I didn’t marinate it the whole time (only an hour or so) and it was still tasty — in the future I’d marinate it longer though! Thank you so much for your absolutely wonderful website. I stumbled upon your website as i was looking for a tilapia recipe and found the crispy tilapia dish which was just wonderful. Then the next day I did the Mediteranian Kebabs dish and my pickey eater daughter looked at her mom and said ” You know what? This ain’t so bad at all”. Thank you for sharing your passion for cooking with others, very much appreciated. i can’t wait to try more of your recipes. So sweet, Ziad. Thank you! I’m making this for the third time tomorrow night. My husband and I absolutely love it! The first time I made it on the grill and I used chicken thighs as recommended. I’d never used them before and it was unbelievable. The second time I made it I mixed the marinade the night before then threw everything in the slow cooker in the morning and it was just as good. Tomorrow I’m using the slow cooker again. I like that the meat falls apart and you just serve it over rice with a side of veggies. This is a new favorite. Thanks! Scissors! After years of using a sharp paring knife to trim fat from chicken thighs, I just tried kitchen shears per your instructions. Thank you! What a difference that small trick makes in efficiency and thoroughness. Thanks, Jenn, again and again! We grill all the time and I can’t wait to try this one. I made the marinade Tuesday night and cooked these on the BBQ last night – omg they were SO DELICIOUS. i made it exactly as described here and wouldnt change a thing…other than making a double batch! The only little thing i did different was marinate the chicken in a bag, and then put it on the skewers the next day. a little messy but worked fine. the onions were delicious. i loved it. oh – I used 2% plain greek yogurt b/c i couldn’t find whole greek yogurt. it was still amazing. This was an easy and very tasty recipe – definite crowd pleaser. I used white meat and also wooden kabob skewers (pre-soaked, of course). This recipe is all about the prep work; then you can sit back and relax – my husband is the grill expert! This was served with my version of yellow basmati rice. The next day, we took the chicken and onions off the skewers and sauteed with the leftover rice to make a middle eastern fried rice. Two super meals! Terrific tasting… used white meat… Never have acquired a taste for thighs. Served with rice… nothing left this morning!! This is amazing! So easy to make and most ingredients are already in the pantry! Love how the yogurt gives it that tang. Perfect with rice pilaf and roasted vegetables. I didn’t had the yogurt at the moment, and I used sour cream, it was a outstanding, everyone love it! Made this dish with low fat Greek yogurt since I could not find the whole milk version, and it still came out very tasty. The only error my husband made while grilling was that he did not cook long enough, so the kabobs had to be put back on the grill to finish. (So check for thoroughness before taking off the grill. Chicken kabobs are easy to undercook.) Still came out great though. Looks great. Will have to try this out soon. Does this recipe work if the kebabs are placed in the oven instead of on the grill? I do not own a grill, and hate being confined to non-grill friendly foods. Boy, were these a HUGE hit with my family! My husband must have said, “Mmmm….this is SO good” about four or five times during the meal, and my 3-year-old gobbled up her chicken and asked for seconds! (She actually ate two servings of the chicken before she touched her rice, which is a first!) It’s definitely worth seeking out whole-milk Greek yogurt, as it adds a richness to the chicken that I think a lower-fat version wouldn’t. The spices in the marinade are just amazing. I served this with mujadarra (Middle Eastern rice and lentil dish) and some peas. As we licked our plates, we imagined how tasty this chicken would be sandwiched into a soft, warm flatbread. Thanks for delivering yet another winning recipe, Jenn! These were wonderful!! Very smooth flavor not overpowering. Easy to make. I subscribed to your blog last week and right away made two winning recipes, this one is one of them. Simply outstanding and so super easy to make. Feeds a crowd. Made my own version of the pilaf – so good ! Thanks ! The kabobs are marinating in the fridge, and we’ll be having them tonight for dinner. Can’t wait to try them. Reporting back Jenn: Made this last night and it was a huge hit. My husband and guest couldn’t stop eating. I bought fresh crusty sourdough bread from the bakery and they kept making mini sandwich bites, wrapping bread around chunks of chicken. Oh yum! I will add this to my “absolutely must make” list. YUMMY! Sounds just like what you get in a good middle eastern kebob restaurant. Am looking forward to making this and hope you send the yellow rice recipe SOON!!! Can’t wait to try this recipe. My husband is not a fan of chicken, but this sounds like something he will like. Love your recipes. This will be the second recipe I will be making. 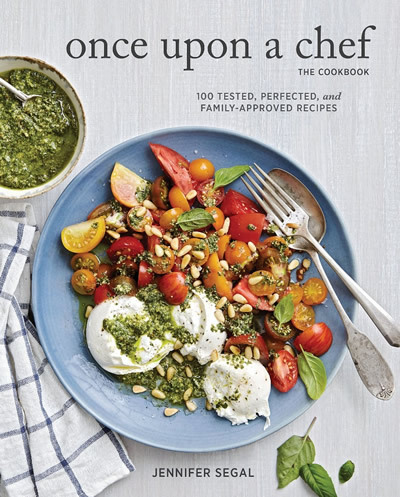 I found Once Upon A Chef last week. Your meatball with the ground veal was the best meatballs I ever made. One night we had them with pasta and the next night we had meatball subs with a little melted cheese. mmmmmgood. Love receiving your recipes and I have tried almost all of them so far. Now with this one however I would like to know how you made your golden basmati rice pilaf. If you wouldn’t mind sharing I would appreciate it very much. I would like to complete this meal. Thank You! for your postings. Another one of your recipes that makes me want to lick the screen! Beautiful! HAHAHA…I thought I was the only one who wanted to lick the screen!! No, I absolutely third licking the screen! These pictures just made me sooo hungry!! You have saved me again. I needed a new easy recipe for company this weekend. Please post the rice recipe too. It looks delicious too. Excellent recipe, which I will make tonight, and excellent subscription. I look forward to it and open the email right away! Gotta run – have to marinate those chicken thighs! And I have to check out that grilled Moroccan chicken recipe before it’s too late to cook outdoors! YUM! Your food always looks so good! I want to eat at your house!